• Fits single doors, French doors and sliding glass doors. • USA Made, soft, durable, charcoal colored screen mesh. • USA Made, high energy magnets automatically close the screen. • Installs with a sturdy, lightweight adjustable spring tension rod. • Won’t damage door frame. Door Size (WxH) in. Choose an option30" x 80"32" x 80"32" x 96"34" x 79"36" x 80"36" x 84"36" x 96"48" x 80"60" x 80"72" x 80"
Custom Bug Off Screens for doors and windows are made one at a time to your specifications and are nonrefundable. • Center Opening screens are available 22″- 72″ in width and any length. • Side Opening Reversible’s are available 40″- 72″ in width and any length. • 1 Panel (No Opening) screens are available 22″ – 58″ in width and any length. • Choose screen options, then press ADD TO CART. In the cart you will be asked your actual width and height. To add additional screens to your order, repeat the process for each screen. Opening Size Width Choose an option22" - 36"36.25" - 48"40" - 60"48.25" - 58"48.25"- 60"60.25" - 72"
Opening Size Height Choose an optionUp to 86"OVER 86"- 96OVER 96"- 108"OVER 108"
Completely portable, installs in minutes no tools required, won’t damage door frame. Mom’s love Bug Off. No more slamming screen doors or screens left open. Screens are portable, take them with you on vacation. Affordable customs, sized to fit. Makes any door a pet door. Large and small pets go in and out without assistance. Originally invented for apartments and condos where screen doors are not allowed. Turn a barn, shed, tack room or greenhouse into a bug-free zone. Not all magnetic screen doors are equal. The cheaper screens take at least 30 minutes to install and attach to the face of the doorjamb with hook and loop fasteners and thumbtacks. This damages the door frame and looks terrible. These products may be slightly cheaper than Bug Off Screen, but ultimately cost customers more to replace. Bug Off Screen started the instant screen industry. More than 20 years on the market and we still use the most durable materials including USA screen mesh that won’t fall apart and high energy USA magnets that snap closed better. Our magnets are sewn onto the screen with strong webbing behind them, so they won’t fall off. 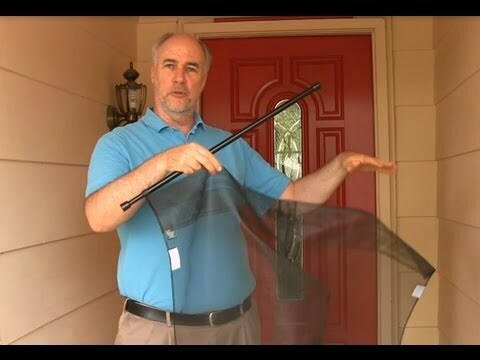 Bug Off Screen installs like a screen curtain in about 5 minutes with an included spring tension rod. No tools are needed and there is no damage to the door frame. The screen attaches to the inside of the doorjamb, rather than the face for a clean, professional look. It’s so easy to install and remove, you can move it from door to door, or take it to your cabin or vacation home. Use it year-round or temporarily wherever you need it. Our space saving design allows for easy storage at season’s end. Bug Off Screen works on all doors – single doors, double doors, sliding glass doors and French doors that open in, or out. See our list of 14 standard sizes. We also make affordable custom sizes for odd size doors and windows. Bug Off Screen Door is great for busy families with kids and pets. It’s also great for parties and BBQ’s, because you can walk through it like a screen curtain, with your hands full without worrying about closing the door. Powerful, center and bottom magnets automatically snap the screen closed, so you can be sure no one leaves the screen open to allow bugs in. Keep your doors open for natural cooling. Save money and energy while keeping the bugs out. Your pets can let themselves in and out, so you don’t have to. No need for pet doors, or doggie doors. Both dogs and cats love Bug Off Screen. Large and small pets come and go as they please. French door and tall door owners save hundreds. Standard French and tall screens cost $300 – $1200. Bug Off Screens cost $40 – $130. Bug Off is available in 14 standard sizes and custom sizes, making it perfect for French doors and patio doors. Bug Off was originally invented for renters who live in apartments and condos where standard framed screen doors are often not permitted. Now you can have easy, affordable insect protection whether you live in a house, apartment or condo, or if you own, or rent. And if you move, you can take your Bug Off Screen with you. If you are not satisfied with your Bug Off magnetic screen door return it for a no-questions-asked, no-hassle refund within 30 days. We guarantee you will not find a better instant screen anywhere. Love it or your money back. Bug Off magnetic screen doors are not security doors. Please do not use them if you want to keep children or small pets inside. We do not recommend using Bug Off Screen in high wind areas, which can prevent the screen from closing magnetically and require you to close it manually.